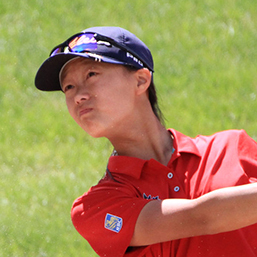 Emily Zhu joins Team Canada as the youngest member in the program. The Richmond Hill, Ont., native had a strong 2018 campaign highlighted by a win in the juvenile division at the Canadian Junior Girls and a runner-up finish in the junior girls’ division. Zhu was victorious at the Golf Ontario Investors Group Junior Spring Classic and finished T2 in the girls’ division at the Duke of York. She was a part of the team represented Canada at the 2018 World Junior Girls Championship. My father introduced me to the game. With a red line and a red “E”. I have a younger brother, 12 years old. I also enjoy trying to read people. I’m not really sure, pull-ups maybe? My last picture was of a farm I was driving by. I think everyone does, even if they say they don’t. A picture of Budha in my bag that my mother gave me (I’m not religious). I don’t have a favourite songs.